If you’re interested in optical clarity (i.e. image quality), or would like to see the overall optical score, check out Part 1 to these optical results. 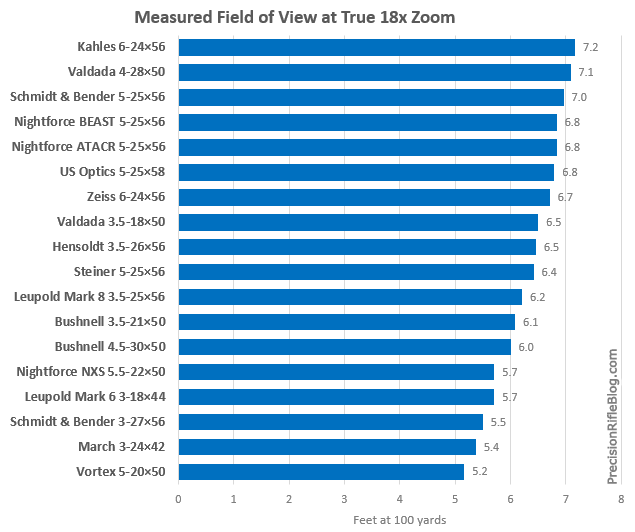 Since the field of view obviously changes significantly based on magnification, looking at the field of view of all the scopes at 18x is the fairest way to compare them. The Kahles K 6-24×56 rifle scope offered the widest field of view at 18x magnification with 7.2 feet at 100 yards, which is quite impressive. But the Valdada IOR RECON 4-28×50, Schmidt and Bender PMII 5-25×56, Nightforce BEAST 5-25×56, Nightforce ATACR 5-25×56, US Optics ER25 5-25×58, and Zeiss Victory Diavari 6–24×56 were all right there at the top as well. I realize being able to see 5.2 feet or 7.2 feet at 100 yards may not seem like much of a difference. It’s just 2 feet, right? 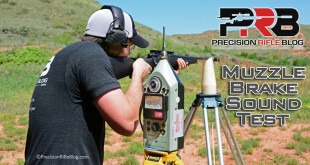 But at 1000 yards, that equates to either 52 feet or 72 feet … a difference of 20 feet! That can be the difference between seeing the target … or it being hidden just outside your field of view. 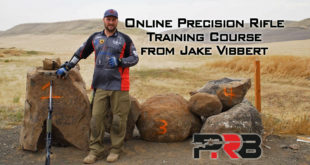 If you need to quickly find a target through your scope (like in a timed competition or a hunting scenario), a larger field of view can be the difference between getting a shot off or not. I also measured the field of view at the maximum and minimum magnification for each scope, and the results for that are provided below. Keep in mind the minimum and maximum zoom varied by scope, and the field of view is dependent on the magnification. For example, a scope with a max zoom of 18x should have a much larger field of view at its max magnification than a scope with 25x zoom. That isn’t a fair comparison. So this data isn’t intended for comparison between scopes (which is why I didn’t display it in a chart), but is just informational purposes. *The Schmidt & Bender PMII 3-27×56 may seem to have a giant field of view for its max magnification of 27x, but I measured its apparent magnification at the max zoom to actually be 22.4x … not 27x. I explain how I measured that in the How To Measure the Apparent Magnification of a Scope post. More on that below as well. Now to defend Leupold a little here, this is something virtually every scope manufacturer does. They’re just unique because they’re actually upfront with this information. I can appreciate that type of integrity. I can also say that they don’t have this type of “optimistic rounding” on all of their scopes. For example, they say the max magnification for the Leupold Mark 8 3.5-25×56 is exactly 25.0, and after measuring it myself … it is exactly 25.0. This was the same case for the Leupold Mark 6 3-18×44 … exactly 18.0. So I’m not trying to throw them under the bus here, but just trying to illustrate that it is a known practice even among the most reputable companies. While a few companies might own up to this type of thing in their published specs, it is worth measuring. I explain how I measured this in exhaustive detail in my How To Measure the Apparent Magnification of a Scope post, so I won’t repeat all that information here. I’d suggest you go check that out if you’re interested, or have doubts about the reliability of this data. Here is a quick image that shows the basic idea, but you should read the whole post if you’d like to know more. One additional note is that I measured this at least two times, on two different occasions for each scope. If the scope was off from what the manufacturer claimed, then I measured it a third time. There was a complete teardown and setup in between each test. I never want to publish anything that might be considered negative without feeling confident I’d done the best I could to ensure the data is accurate. Note: Since I did run this multiple times, I can estimate the accuracy of this information to be ±0.5x. The new Schmidt and Bender PMII 3-27×56 scope is the only one that is grossly off. It is advertised to have a max magnification of 27x, but I found the apparent magnification only went up to 22.4x. When I first calculated it, I thought I must have done something wrong … but after repeating the process several times, I’m confident this is reality (at least for the scope I had in hand). I may have just got a bad unit, but I tried to contact Schmidt and Bender a few times during this field test and didn’t get a response. This was one of the brand new scopes that the guys at EuroOptic.com let me borrow for the tests, and since it has a $7,000 price tag … I didn’t feel comfortable asking them for another one to double-check. 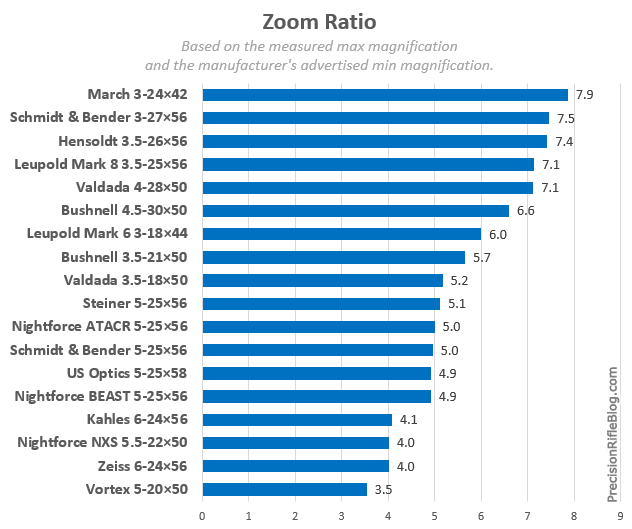 One optics expert did tell me during the peer review period of these tests that you can typically expect 3-5% variance in magnification due to variations in the eyepiece or objective focal systems. For an 18x scope, 5% is 0.9x, and for a 25x scope 5% is 1.25x. So some slight differences may be inherent to the complexity of these optical systems. However, a few of these companies nailed it, so I’m not sure if they have tighter tolerances or if I lucked into a good test unit. I didn’t measure the min magnification, because of how time consuming all this was. Most long-range shooters are more focused on what the high-end is on the magnification range, which is evident from the screenshot shown previously of the Leupold website. They have a column to indicate the “Max Magnification,” but not the “Min Magnification.” While the low end of the magnification range isn’t unimportant, it is simply less important to most shooters. For example, a 6-24x scope would be 24 ÷ 6, which equates to a zoom ratio of 4. Likewise, a 4-28x scope would be 28 ÷ 4, which is a zoom ratio of 7. Pretty simple, right? High zoom ratios are obviously desired. I wish I had a 1-50x scope, just like everyone else! Rifle scopes with high zoom ratios are simply more flexible, because they give you good low end magnification for a wide field of view and quick target acquisition, but they also give you a lot of magnification for those long-range shots. You simply don’t have to compromise. But to say that cranking up the zoom ratio is difficult, would be an understatement. I don’t claim to be an expert in optics design, but I’ve talked to enough to know how complex these systems have become over the past few years. I won’t bore you with the details, but suffice to say … they’re all putting a lot of effort into continually raising the bar on this front, and we’re all benefiting from it. 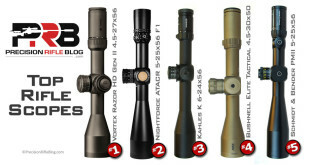 Right now, most high-end rifle scope designs from the past decade have a zoom ratio of 4 or 5, with a few reaching 6. 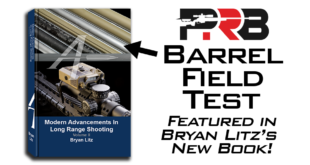 But in the past couple years, new scope designs have continued to press the limits. Here are a few of the scopes in this test that have huge zoom ratios of 7 or 8, and some are aspiring to even more. There are even a few new designs in the works that are pressing a zoom ratio of 10, like a 5-50x scope! Here is a visual representation of the actual magnification range of each scope, with the max magnification reflecting what I measured it to be and the min reflects what the manufacturer advertises. See how some lines are longer than others in the chart above? The length of the line represents the magnification range the scope covers. Zoom ratio is closely related to the length of the line, although they aren’t exactly the same thing. 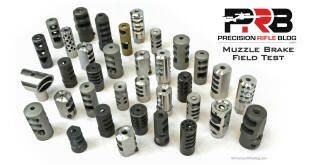 You can see the March Tactical 3-24×42 FFP scope is way out ahead, and they are one of a leading innovator in this area. In fact, they’re a company pressing that 1:10 zoom ratio in their newest designs. The Schmidt and Bender PMII 3-27×56 High Power scope should theoretically have a zoom ratio of 9, but I measured the max magnification to be 22.4 … not 27. So that meant the zoom ratio was closer to 7.5, but that is still outstanding. The scope Hensoldt released a few months ago in the Hensoldt ZF 3.5-26×56 is an impressive scope all around, including its 7.4 zoom ratio. 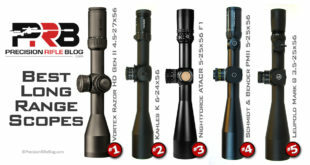 The Leupold Mark 8 3.5-25×56 and Valdada IOR RECON 4-28×50 are also pressing the limits with zoom ratios above 7 as well. Valdada IOR is a perennial innovator. They actually released this design in 2007, which I believe made it the first to have a zoom ratio of 7 or more. A few people have asked me how other optical aspects compared, like chromatic aberration (CA), tunneling effect, etc. There are actually several optical aspects like that which I didn’t test either because I couldn’t find an objective way to quantify them, or I considered them secondary to the other aspects I focused on. For example, the guys at Leupold spend a lot of time trying to get the entire field of view clear and sharp, so they were encouraging me to somehow rate edge-to-edge clarity. However, although I don’t think that is unimportant, I tend to side more towards ILya on this point (and chromatic aberration as well). I have a pragmatic view of this. It’s not that I’m okay with tunneling effect, or poor CA, edge clarity, or depth of field … they just aren’t reasons I missed a shot. I can’t say I’ve ever missed an animal or dropped a point in a competition because my scope lacked in those areas. I’ve missed lots of shots, for lots of reasons … just not those. But, if you’re interested in seeing that information, ILya has published an outstanding article that looks at a few of these exact scopes and evaluates those finer points of optical performance. You can find that at http://opticsthoughts.com/?page_id=1254. Truly awesome testing! Nice to see someone putting the best to a practical and understandable compare. Good job! A good and solid start to baselining scopes. On the question of like with like, I think the March 3 – 24 x 52mm or the 5 – 40 x 56mm would be more in keeping with the other front lens sizes on test. Yes sir, I tried to get those and couldn’t get one in time for the tests. The March 3-24×42 was the best I could do, and I figured having a March represented was better than nothing. At the very least, the mechanical results, ergonomics, and advanced features should give a good representation of March Scopes. Thanks Cal. I have both the 42 and the 56mm versions and have tried the 52mm. There is no real comparison between the 42 and 56mm as the 56mm addressed the issues that emerged from the development of the 42mm version such as stiff focus ring and reticle dimensions. Hopefully you will be able to get your hands on the 5 – 40 x 56mm in due course and run that as an annex! Continued accolades & appreciation for your work. By any chance are you going to SHOT? 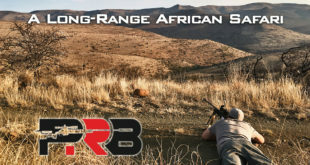 If so I hope you will engage S&B directly on discrepancies you found with the 3-27×56 that EuroOptics was kind enough to provide. It just seems unfathomable that a company like S&B would produce their latest creation with such a glaring divergence in spec versus reality when it comes to the maximum zoom. One can hope that the scope you has was defective since there would be no reason to purchase a scope for $2000 more that has less effective magnification than their 5-25×56. Thanks, Ranger. I will be at SHOT, but I’ve already talked to a rep from S&B. He said there were some defects with that scope, but they had to do with the parallax and I’m not sure they would impact the apparent magnification. I’m sure they’ll all be looking forward to talking to me at SHOT! 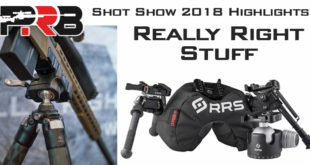 I may not be a popular guy there this year, at least among optics companies. I’m anxious to see what their reaction will be, if any. Ha! If it’s any consolation you ARE popular with your intended audience. The good news is you are SO detailed in your analysis that I am sure those German engineers will be intent on addressing your input ( also, it’s probably not lost on them that you are developing a significant following of potential customers who value unbiased reporting). 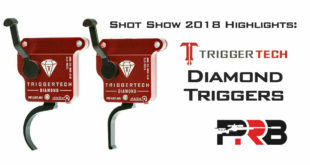 Looking forward to your report(s) from and after SHOT show. Cal, firstly this article is incredible! 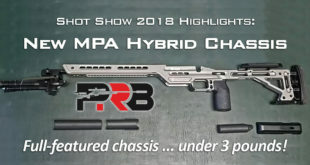 I found you while searching for the best glass suggestions for a new rifle platform, and you have a new reader for as long as you’re writing it. 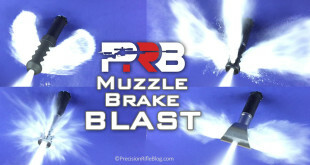 Just piggybacking on what Ranger said, it’s shocking to see the S&B with such a low actual magnification. Did you find anything out from them at the SHOT show, or have you been able to check out a different scope to see if that one was defective? I didn’t. I feel like they’ve already given me their official response. I haven’t tested any additional scopes. 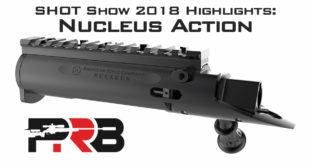 A friend at EuroOptic.com sent me that one to test (S&B wouldn’t return my emails before I started publishing results), and I don’t feel comfortable asking them for another $7000 scope that they will then have to sell as a used scope. (On another note, isn’t it great that they sent me 4 scopes and were willing to sell them used for the original test? Two of those were $7,000 scopes. Good guys over there.) Plus … I’m tired of testing scopes. I’m out at this point. Sorry I couldn’t be more help. Not a problem at all! Just curious because it sounded like you were as perplexed with that result as I was. And, yes, EuroOptic.com came through big time! I may have to send some business their way. 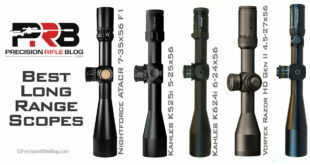 I have the S&B 3-27×56 and the 2 of 5-25×56. I have compared max zoom of 25’s vs 27. The 27power picture is closer than the 5-25×56 by a bit. For example with the 25power scopes when observing a target at 1000 vs the 27 power scope, I can see more of the human sized target with the 27 power than the 25 power. It has more resolution at max 27 power than the max at 25 power. Maybe it really is 27 power. I have had 3 other people compare as well and their thoughts were the same as mine.Any thoughts?i have also compared all 3 at 25 power on same target. They were all equal. Just thought you should hear my observation along with 3 other observers. Now just to mix things up, I also compared the kahles 6-24×56 at 24 power and at distance of 1000 yards when compared to the three S&Bs at 25 power. The all seemed equal in power zoom. In closing, this was a lot fun to compare. I really appreciate you sharing your observations. Honestly, I don’t have an answer for the differences. If I were to guess, I’d think there was something wrong with the scope I tested … but it came off a retail shelf at EuroOptic.com (i.e. it wasn’t a test scope sent to me from Schmidt and Bender directly). So at the very least it’s concerning that there would be a big issue like that make it to the customer, especially at that price point. I pretty much expect perfection at $7000. If I ever test another batch of scopes, I’ll try to include another Schmidt and Bender 3-27×56, and run through all the same tests with it. I don’t have any plans to test scopes in the near future, but I might change my mind at some point. It is a lot of fun to compare! Thanks again for taking the time to share your experience with the rest of us. I think the zoom ratio formula (Max/Min) may be a bit misleading. The formula “punishes” a higher starting magnification scope and favors one with a lower starting magnification. E.g. A 20-60 spotting scope has a factor of 3 and a 1-6 AR scope had a factor of 6. The spotting scope obviously has a greater range of magnification than the AR scope. I can see your point, Ted. Zoom Ratio is a really well established way to quantify that. I didn’t just make that up. But, I knew there would be people who didn’t agree with some part of the test or scoring, which is why I spent an enormous amount of time and effort publishing every single bit of data the scores are based on. That gives you everything you need to do your own custom calculations, and use the results of my test to come up with your own scoring method that you think is more relevant for your application. You could do it in Excel in just a few minutes. Go for it.